OSWEGO, NY – The Club House Tavern in Oswego and Eagle Beverage have joined together to cook up an idea to benefit United Way of Greater Oswego County’s annual Stuff-a-Bus campaign. The Club House Tavern will host a special breakfast on July 26 to benefit United Way of Greater Oswego County’s Stuff-A-Bus campaign. From left are planning committee members Jim Schneider; Ali McGrath; Executive Director United Way of Greater Oswego County Melanie Trexler; Bernie Coe; and co-chairperson Dan Dorsey of Eagle Beverage. Absent are breakfast hosts Liz and Robert McGrath; co-chairperson Liz Dorsey; Laurie Kelly; John Kelly; chief cook Patrick Barry. On July 26 from 8 – 11:30 a.m., The Club House Tavern, 126 W. Second St., will host a breakfast in support of United Way’s Stuff-A-Bus campaign. 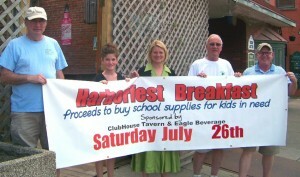 Sponsored by Eagle Beverage and The Club House Tavern, and coordinated by a committee co-chaired by Dan and Liz Dorsey of Eagle Beverage, the breakfast is open to the public. Made possible through a partnership with United Way, school districts throughout Oswego County, and more than 20 business and organizations, the Stuff-A-Bus Campaign, collects donations of school supplies for distribution to less fortunate students throughout Oswego County. The highlight of the Stuff-A-Bus Campaign will be a special collection day on August 20 when school buses will be at the following sites from 9 a.m. – 3 p.m. to accept donations of school supplies from pens and pencils to notebooks and backpacks. For more information on the breakfast, or the Stuff-A-Bus campaign, or the drawing for the mountain bike, call 315-593-1900.